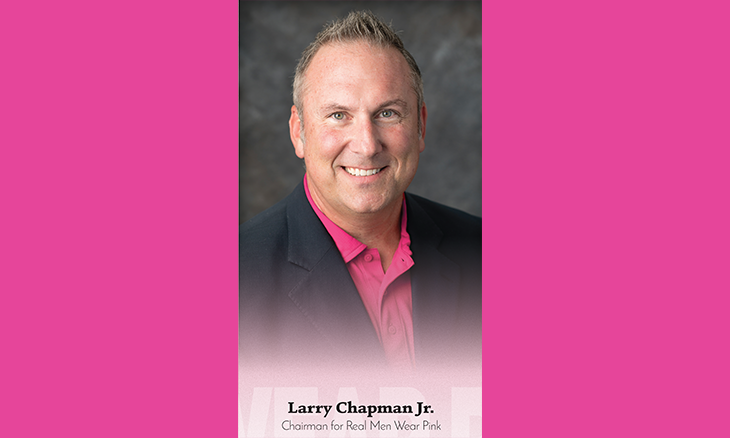 Real Men Wear Pink- Larry Chapman Jr.
Larry is a Montgomery man through and through. A product of the public school system. Dozier Elementary, Georgia Washington Junior High and Jefferson Davis High School. He grew up in Carol Villa where his mother still lives. After high school he attended Auburn University on a football scholarship from 1988-1990, playing on a Pat Dye SEC championship team. He completed his college career playing basketball at Auburn University Montgomery for his dad, Coach Larry Chapman. Larry received his Bachelor’s of Science from AUM in 1993 and in 1995 earned a Master’s in Education Leadership and Administration. With his graduate degree in hand he got a call from Hall of Fame coach Spence McCracken (Robert E. Lee High School) to be on his inaugural staff as McCracken began his career at Opelika High School. In 1997 he joined the fortune 100 company Merck Pharmaceutical in marketing and sales. Then in 2002 Blue Cross Blue Shield of Alabama recruited him to join their team. For the next decade he led the central Alabama operation for the Blues. In 2012 he embarked on his current endeavor as the Owner/President of Chapman, Inc. His shop (Chapman, Inc.-Benefits|Insurance|Consulting|Non-Profits) partners with regional companies to sale and service employee benefits and all lines of insurance. He also consults businesses to streamline and simplify their offerings and in recent years has become involved with creating non-profits. The first was the Coach Larry Chapman Foundation and most recently…As the creator and executive producer for the video series “Heroes Behind The Heroes.” Larry serves on many local boards such as the YMCA Metro Board, he was a 2016 nominee for the YMCA Man of the Year, The Jimmy Hitchcock Board of Directors, The American Cancer Society Board, he chairs the annual Real Men Wear Pink campaign, he serves as a deacon at First Baptist Church, he teaches the 10th grade Sunday school class, and hosts a weekly 11th grade young men’s bible study at his home. He is a current board member for Life On Wheels created and founded by Dr. Matt Phillips. In the past he has served on the Trinity School Headmaster’s council, the FCA Board of Directors and the Montgomery Area Chamber of Commerce Board of Directors. Larry embraces community service of all aspects. His favorite saying, by Maya Angelou, “I’ve learned that people will forget what you said, people will forget what you did, but people will never forget how you made them feel.” A favorite saying from his mother. Larry Chapman joined ALFA this year and is looking forward to being a part of the company. He is married (21 years) to his best friend, Suzanne Eskew Chapman, (Montgomery native) and they have two daughters.